So a couple of weeks ago at work, the word came, “There’s an iguana downstairs”. We rushed down to see it and there is was, a dragonish monster that had trapped a member of staff in a passageway. 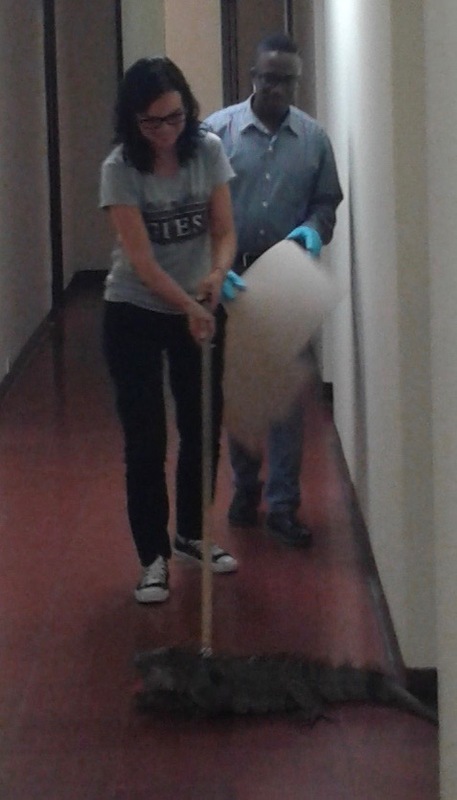 My colleague, Maria, who is from an area of Colombia where iguanas are more common, took a broom, encouraged it along the corridor and off it skeddadled in a great, anxious patter of its webbed feet. Instead of going out the wide-open doorway, it managed to get behind the wrought-iron gates, but undeterred, it wriggled through an impossibly small space, and went on its way, presumably not rejoicing. Just so you know I’m not making a fortune from my writing! If you’d like to help me up my earnings from a paltry 1 US cent, you can buy my novel as an ebook from amazon.com, amazon.co.uk or smashwords. Or you can browse my designs on zazzle. Comments Off on Just so you know I’m not making a fortune from my writing! You see, the thing is that most babies are cute.